Stanislav Nikolaevich GLAZACHEV — 75th Jubilee! Sagadulla Abdullatipovichu ABUSUEV — 75th Jubilee! A new Network electronic scientific Journal “Herald of the International Academy of Science. Russian Section” (HIAS.RS) continues traditions of the printing issues under the same title “Herald of the International Academy of Science. Russian Section (Registration Certificate for mass media PI #FS77-19971 of 29.04.2005). It is issued twice a year beginning from 2006. 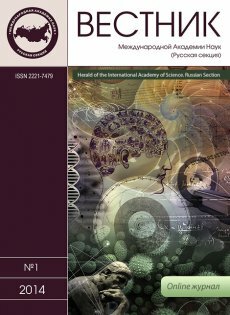 The Journal (print edition) publishes basic theoretical and resumptive scientific and science-applied articles on actual problems of modern biology and medicine, ecology, education, physic-technical, social, public sciences describing the contribution of Russian and foreign scientists to world science. Unlike the print edition of the Journal which is available first of all for publication of papers and review articles from IAS (Health&Ecology) Russian Section members and other national branches of the Academy, Network electronic scientific journal will give a chance of publishing for young scientists of Russia and other countries engaged in interdisciplinary research at the turn of several specialities perspective for international collaboration.